Breadfruit is a large sized fruit obtained from the huge tropical rain-forest fruiting trees in the mulberry family. It is closely related to the other tropical fruits such as jackfruit, breadnut, figs, and mulberries. Breadfruit has got its name from the consistency of the cooked fairly ripe fruit that tastes like potato - something akin to bread that has been just baked. Usually, breadfruit trees grow about 82 feet (25 meters) tall. The leaves of this tree are large and thick, cut deeply into pinnate lobes. All the parts of breadfruit tree yield a milky juice or latex, which is used for caulking boats. Breadfruit has a green hue and on maturing the fruit oozes some sap that makes the fruit appear further yellowish when ripe. The texture of the fruit is starch-like, while its fragrance reminds one of freshly baked bread. Breadfruit is very nourishing and even its seeds can be consumed. When the breadfruit is completely ripe, it becomes soft and fragrant. The flesh of the fruit is starchy and has a creamy yellow hue. The seeds are unevenly oval-shaped. In the center, the fruit has a cylindrical core, but no seeds. In the number of breadfruit species, the core is covered fully with hairs and contains little seeds. The sweetness as well as the fragrant of breadfruit vary from one type to another. The fruit has unique flavor and texture used in subsistence as other tropical staples such as rice, sweet potatoes, taro, banana, and coconut in many of the East Asian, Micronesia, Polynesian, and Caribbean countries. By nature, breadfruit trees are monoecious, which means both male and female flowers appear on the same tree. The male flowers of breadfruit tree bloom first and soon the female flowers appear. The female flowers grow into capitula and can pollinate within only three days of blooming. The swollen perianth gives rise to a compound, false fruit, which has its origin in as many as 1,500 to 2,000 flowers. These minute flowers can be seen on the fruit’s skin. They appear in the form of hexagonal discs. Breadfruit trees can also grow well in sand, loam, sandy loam and sandy clay loam. 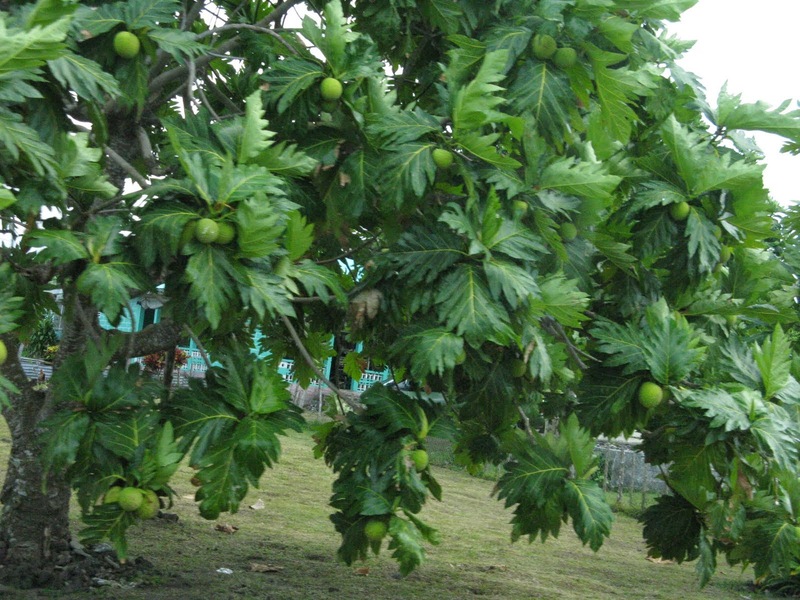 In addition, breadfruit trees also grow in coral sands as well as salty soils. Apart from consuming ripened fruit raw and the raw fruit as a vegetable, breadfruit is also used for therapeutic purposes. 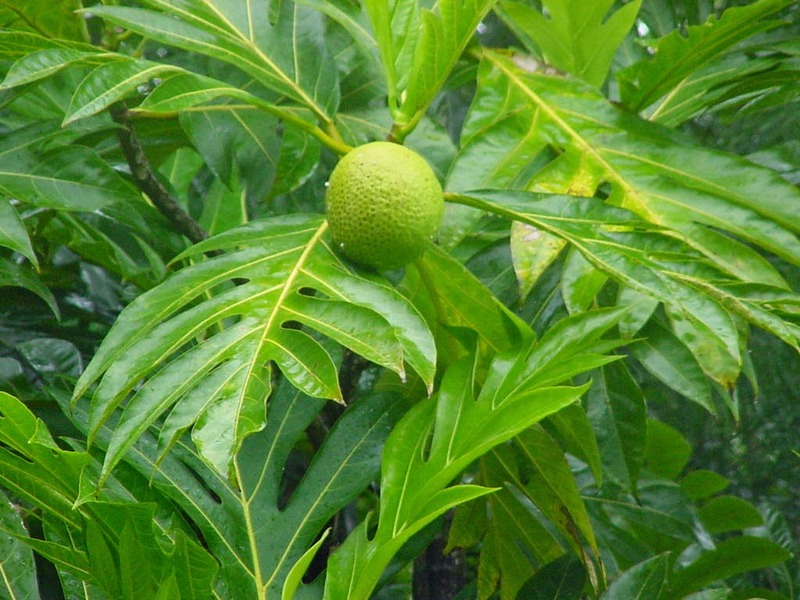 People in the Caribbean, especially in Trinidad and the Bahamas, prepare a decoction with the leaves of breadfruit tree and drink it to alleviate hypertension (high blood pressure). The leaves of this tree are also crushed and the paste spread on the tongue to treat thrush. The juice extracted from breadfruit tree leaves is used in the form of an ear-drop. The fruit is also crushed and applied in the form of a poultice on tumors with a view to "ripen" them. The flowers of breadfruit tree are also roasted and massaged on the gums in the region of an aching tooth. The latex (milky white substance oozed by several parts of the tree) is employed to treat skin diseases. The latex is also used in bandages on the spine to alleviate sciatica pain. The breadfruit itself contains high amounts of dietary fiber. The dietary fiber content of unripe breadfruit is extremely beneficial for people suffering from diabetes. Studies undertaken to determine the health benefits offered by breadfruit have proved that consuming this vegetable on a regular basis can considerably lessen the chances of developing diabetes and when people already suffering from this condition consume this vegetable, their blood sugar levels are kept under control. Breadfruit helps to regulate blood sugar levels by lessening the assimilation of sugar by the human body. As the breadfruit contains elevated amounts of dietary fiber, it works excellently to boost one’s energy. Consumption of breadfruit gives the feeling of being full, but does not augment the intake of calories. Hence, people consuming breadfruit not only feel energetic, but also remain active. In addition, breadfruit is also excellent for decreasing the risks of developing cholesterol problems and heart disorders. Several studies undertaken to assess the health benefits of breadfruit have demonstrated that it facilitates in reducing LDL cholesterol (also known as "bad" cholesterol), while increasing the levels of HDL or "good" cholesterol. As in line with other tropical fruits, breadfruit too holds lots of calories.The major fraction of this comes from the carbohydrates. Ripe fruits are sweeter since their starch content is converted into sucrose and simple sugars like fructose and glucose. Apart from the nutrients mentioned above, breadfruit also encloses high levels of omega-3 fatty acids as well as omega-6 fatty acids; these two essential fatty acids make it an excellent food for the health of the heart. At the same time, these fatty acids are also useful for the health of our skin and hair. Omega-3 fatty acid is especially good for the development of the mind and brain. According to experts, to a great degree, breadfruit consumption on a regular basis may facilitate the development of the brain. It has small amounts of flavonoid anti-oxidants in the form of xanthin and luein. Yellow-orange varieties have more of these compounds. Breadfruit has more vitamin-C than jackfruit, and banana, provides about 29 mg or 48% of RDA. Vitamin-C (ascorbic acid) is a strong water-soluble antioxidant. Consumption of fruits rich in the vitamin C help body develops resistance against infectious agents and scavenges harmful free radicals. Breadfruit seeds contain average levels of protein . However, they are excellent sources of minerals like potassium, iron, calcium, zinc, selenium, manganese, etc. Eating breadfruit on a regular basis also helps to ensure healthy bowel movement and also the functioning of the intestines. The dietary fiber content of breadfruit also facilitates stool passage and aids in eliminating toxins from the intestines. Generally, breadfruit is believed to be a perfect and healthy diet. It is a very good food for people who are enduring overweight or are obese. It is highly beneficial for obese people because it not only contains very less calories, but lots of dietary fiber. Moreover, the dietary fiber enclosed by breadfruit helps in several different ways and is effective for dealing with body fats as well as cellulites. Consuming breadfruit regularly helps to enhance the skin’s health both from within as well as outside. Findings of scientific studies undertaken recently have corroborated the fact that breadfruit contains valuable antioxidants that help to prevent skin rashes and infections. Eating breadfruit regularly also helps to improve the skin tone. In fact, it has been established that consumption of breadfruit in sufficient amounts helps to ensure a smooth and glossy skin. In fact, breadfruit is a wonderful resource of various different types of vitamins as well as essential minerals. This attribute of breadfruit makes it a healthy choice for people who are concerned regarding the health of their hair. Omega-3 and omega-6 fatty acids present in breadfruit are responsible for the health benefits it offers to our hair follicles. Precisely speaking, this particular vegetable is excellent for people desiring healthy and dense hair. Consuming breadfruit regularly helps to make the hair roots stronger and, at the same time, promotes hair growth. Breadfruit also helps to effectively put off hair disorders like dandruff. All said and done, breadfruit is a wonderful natural treatment for hair thinning. Consumption of breadfruit seldom causes allergic reactions. Even there are no reports of people being intolerant to this fruit. Nevertheless, one should never consume unripe breadfruit raw, as it may result in choking the respiratory system. The unripe, green fruit should only be consumed after cooking.